There are times when a pet needs maximum calories and highly digestible proteins to recover from long term illness, cancer, major surgery, sepsis, parasitism, gunshot wounds and the type of emaciation we sadly see when pets are found weeks after being lost. This is not complicated. The diets we recommend are the same high calorie, high protein, easy to digest diets we recommend for baby puppies and kittens. Or, we often use an excellent liver based diet called A/D made by Hill's Science. "Certain conditions associated with debilitation, cachexia, anorexia, or hypermetabolic states require nutritional support during convalescence. 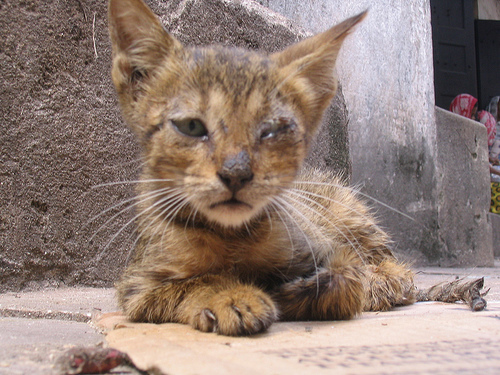 These conditions include trauma, sepsis, fever, starvation, malnutrition, weight loss, neglect, abscesses, burns, severe parasitic infestation, infectious disease, autoimmune disease, anemia, peritonitis, potassium depletion, administration of catabolic medications, and surgery"
A/D diet is high in protein, fat, and highly digestible carbohydrates. It has added Omega-e Fatty Acids, branched-chain amino acids aid in promoting wound and tissue healing, preserving lean body mass and maintaining body defenses in sick, debilitated, cachectic and anorexic pets. A/D has high levels of glutamine which helps support the metabolic requirements of the small intestine and may stimulate the immune system. A/D has added antioxidants to defend cells from free radicals, promoting a healthy immune system and added potassium to prevent depletion. We use a couple cases of A/D diet each week at our clinic. The biggest reason we use so much A/D diet at our hospital is because it tastes so good. Sick pets will eat this stuff when they won't eat anything else. Quickly give your pet vital supplemental nutrition when he needs it most. Also ideal for working, hunting, or other active dogs as supplemental nutrition. Contains fats (including essential fatty acids), vitamins, carbohydrates, and proteins in a flavorful corn syrup-based paste. Each teaspoon equals 30 calories. For dogs and cats. Energize your dog or cat with this energize your dog or cat with this palatable high calorie and vitamin dietary supplement. For dogs and cats who will not eat or need an added source of energy. Great for sporting and working dogs, pregnant or ill dogs and cats, and the picky eater. Also a source of Linoleic, Eicosapentanoic Acid, Docosahexanoic Acid and Omega-6 & Omega-3 Fatty Acids. We get several cats a month that look like the poor creature above and it's always a good feeling when we can successfully get them cleaned up and healthy again.